Click to enlarge, or download a pdf. 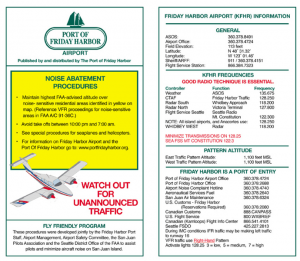 The Friday Harbor Airport is in the middle of an area with very low background noise. Island residents place a high value on a quiet peaceful environment. 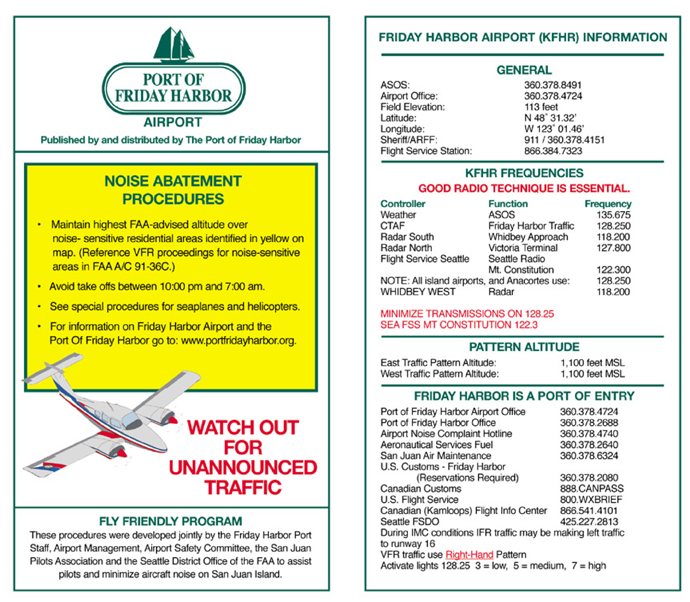 Because of this, almost all residents of the San Juan Islands are very sensitive to aircraft noise. Fly Quietly! FAA rules, weather and safety considerations may at times require deviation from these suggested procedures. 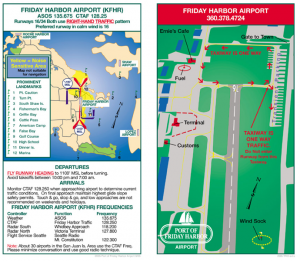 Note: All island airports and Anacortes use 128.25. GOOD RADIO TECHNIQUE IS ESSENTIAL! Both 16 and 34 use RIGHT-HAND traffic. Reduce power as safety and performance capabilities allow. If possible climb to minimum of 1100 feet MSL before turning and only turn when past MARINA (Northbound) or GOLF COURSE (Southbound). Both runways: Traffic pattern is RIGHT-HAND on both 16 and 34. Maintain highest altitude AGL practical while on final approach. Fly at or above the PAPI glide slope. 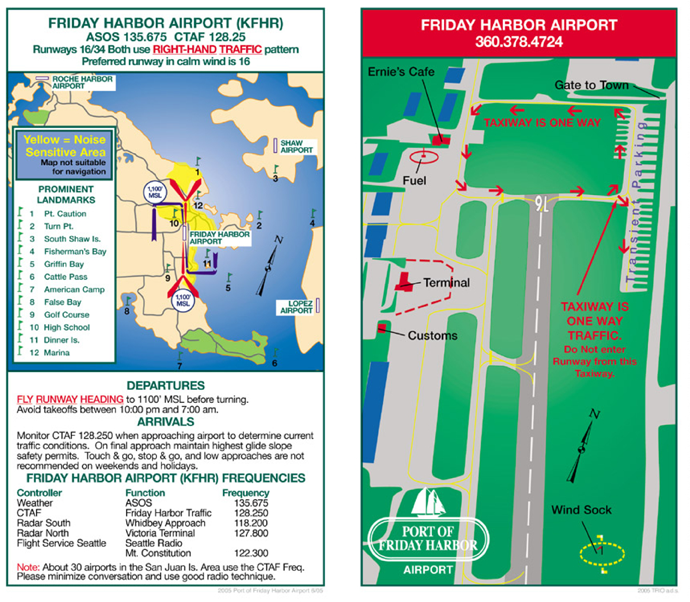 NOTE: Please avoid takeoffs between 10:00 p.m. and 7:00 a.m.
“Calm-wind” preferred runway is 16. Please Watch Out for Unannounced Traffic! There is no substitute for alertness in the vicinity of an uncontrolled airport. Thank you!